Vermont was one of the first states to take decisive action to try to curb the harmful consequences from the repeal of network neutrality. 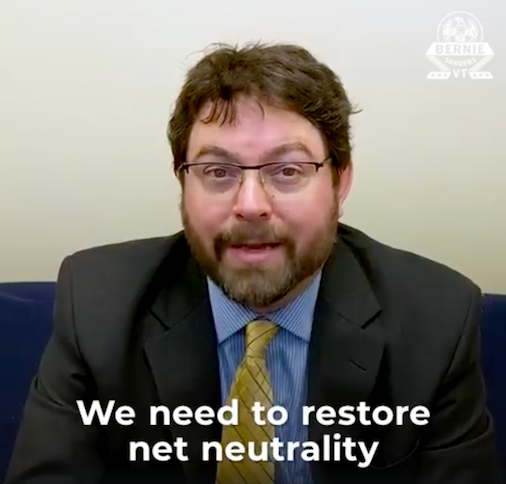 It’s only fitting that Senator Bernie Sanders recently released a video on network neutrality featuring one of the country’s experts on connectivity — our own Christopher Mitchell. The video details how the FCC’s decision to eliminate federal network neutrality protections will harm rural America. Christopher describes the lack of competition as it exists today and how services and prices will change to the detriment of subscribers if we move forward without network neutrality in place. When FCC Chairman Ajit Pai and the other Republican Commissioners voted to repeal network neutrality last December, advocates mobilized. The decision put more than 170 million Americans at risk of losing market protections. By using the Congressional Review Act (CRA), Democrats in Congress hope to reverse the Commission’s decision. The repeal formally goes into effect on June 11th. On May 16th the Senate voted to reverse the FCC decision, 52 - 47; the next step in the process requires the House to take up the measure. Groups such as Fight for the Future are prepared and have started campaigns to convince the House to vote on the same issue. You can sign their Red Alert for Net Neutrality here.